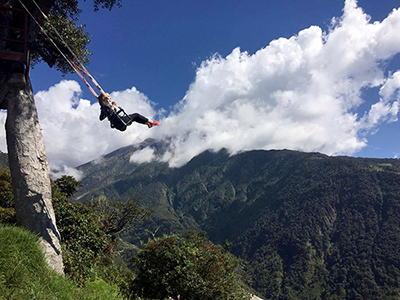 Student Emily Tatum takes a swing in the Ecuadorian Andes. Concentrations are individually selected foreign areas of emphasis in which students take a minimum of 12 semester hours in at least 3 different disciplines or fields. Many students earn concentration credits while studying abroad. Students choose either a functional concentration or a regional concentration. The International Studies program (ITS) is an interdisciplinary major in the Department of Global and Intercultural Studies in the College of Arts and Science. Students can earn a Bachelor's degree (BA) in International Studies. We believe that most global problems and issues are too complex to be understood through a single disciplinary perspective. Students learn about the world through a multiplicity of lenses. All of our students are expected to study abroad.